Article by Richard Berckleman Master builder, Real Estate Sales. It is true to say that people judge a book by its cover yet when looking for ways to improve the chances of selling your home most people look at internal renovations or upgrading the bathrooms and kitchens. Home owners can often spend a fortune on things that do not improve the street appeal of a home. Whats the point of having a great kitchen if you can’t get the client inside to view it? If you want to sell your home you need to look at it as a potential client would! The first thing a purchaser does when seeking out a property is to look at internet or newspaper listings for properties for sale. The first impression a customer gets is from the photographs of the home. They look at the internal photos but the ultimate decider is the overall appeal of the property. When a client comes into the office to look for a property, they are searching for specific conditions such as 3 bedrooms, 2 story, garaging etc… but when they inspect the property other things far more important to them come into consideration. So 3 BIG tips? What Are They? Privacy is most important. The home may be beautiful inside but if overlooked by surrounding developments the private space of the home is reduced. Maybe the neighbors windows look straight into the home, maybe you feel like you are being watched no matter where you are in the house. The home may offer everything you want except you have the feeling of being exposed because the home does not have adequate security. You may feel exposed to the threat of intruders or it may be that your concerns are the security of your children or pets. All clients ask to see the street frontage of the property before considering the internal layout. Sure clients want come into the office and ask for a 3 bedroom 2 bathroom home with a garage but when they are considering which homes to view, it’s the street appeal of the property that gets them through the front door. You can’t sell a home if you can’t get the clients in the door to inspect it!!! So what would I do? Firstly, adding privacy screens and raising fence heights in selected areas to increase privacy. If overlooked from above it is best to add a pergola or outdoor covered space. If your fences are at a maximum height as allowed by the state fencing codes add a natural hedge plant or wire and vines to increase your privacy. Privacy is the number 1 reason people feel uncomfortable in a new property. This guide to designing and building your own fencing and gates has all the information you need to make a huge difference to your home and sale values. It even contains links to the local county fence codes and a collection of letters to send your neighbors. Security is a major issue. Some people can observe and overcome security problems but most clients feel uncomfortable in the property but can’t explain why. If you have young children your major concerns would be their welfare and security. May security issues are raised by lack of privacy so curing privacy issues can go a long way toward making your potential sale successful! Street appeal is the magic that attracts people to fall in love with a property. It may be character filled heritage homes or super modern developments but in all cases it is the street appeal that helps get the clients into your home! I have driven many clients to view properties and in some cases the client will pass up the opportunity of viewing the home based on their impression from the street! They don’t even leave the car even though the property offers all the required items the customer has requested! Street appeal is a personal thing. Some homes are just plain ugly and have little appeal. So wh at is the secret to dramatically improve the street appeal or presentation of your property? The secret to dramatically changing the street appeal of your property, while at the same time improving or curing privacy and security concerns is to change or install new fencing, screens and gates. Fencing and gates cost considerably less than kitchen or bathroom renovations and will dramatically improve your sale price. Fencing and gates can improve the street appeal, privacy and security of your property cheaply and quickly. Plus most handymen can build decorative wooden fences and gates themselves and save a fortune! For more information view the articles below on fencing, screens and gate improvements for your home, plus links to DIY plans! Driveway gates are the entrance to your property and a well designed and made feature gate will transform the street appeal of your home and values! You can change the appearance of your home quickly and economically by changing your fencing and gates! Modernise your home with horizontal timber slat fencing and screens or renovate your period home with decorative timber picket fencing! Who pays the cost of replacing my boundary fence? It’s A Fence – Not A Kitchen! What is the fencing material to reduce noise? How to build a decorative wood pergola in 1 weekend! 750 Fence & Gate Designs – The Ultimate Guide To Fencing! Does my fence have to be exactly on my boundary? In simple, the answer is NO. Sometimes it is not possible to place a fence on the exact boundary. Such an example would be where a cliff face separates the two properties. You need to provide a fence at the top of the cliff regardless of whether that is on the boundary or not. View www.alldayfencing.com/adfcouncil.php for more information. If the fence is not on the boundary, who owns it? As discussed above a fence does not have to be located exactly on the boundary, however the fence is still a boundary fence and is accepted by both neighbors as the boundary of their properties. Therefore if the fence required replacement both neighbors still equally share the cost of replacing a similar fence. Should I have a survey done for my new fence? For the reason above it is not required that the fenceline be surveyed if both neighbors are in agreement as to the location. If your home has just been built and no fences currently exist a survey is recommended and may be part of the development/building application. If you are constructing a concrete, stone or brick fence this must be approved by your local county office prior to construction. I want to build a brick fence and my neighbor wants a less expensive timber fence. What can I do and who should pay? If you prefer a more expensive fencing, unless your neighbor is in agreement, they are only liable for half the cost of replacing a similar fence. You would have to pay the difference. How should I approach my fencing repairs when my neighbor is a apartment block / commercial building? For dealings with property managers or private companies it is crucial that they are informed prior during and after the course of the job. The most appropriate method is to send written correspondance prior to proceeding with any works. Your letter should state your intentions and their responsibilities regarding access and payment. Download our collection of ‘Letters To Serve Your Neighbors RE: FENCING’. Cut and paste the required letters and send as needed. 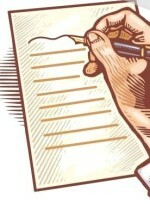 Letters to serve your neighbors includes legal advice for the correct follow up proceedure to ensure you are reimbursed the costs you are owed and avoid costly neighbor disputes. My fence is not located on the boundary, who owns it? who pays? The construction of fencing and gates involves the use of water resistant timbers. Most fencing and gates are constructed from Hardwood or Treated Wood. Fencing is designed to be quick and easy to install and the materials are designed to be inexpensive. This is because most fences are quite large and need to be erected quickly. For these reasons fencing woods are often prone to expansion and contraction due to exposure to the elements. The timbers used are sufficiently treated or primed to last a long time outdoors, however it does come at a cost! Wood used for fencing is often sawn (rough grade) and is farmed with a short turnaround of about 7 years. The finish is not as smooth as seasoned lumber and therefore cannot be finished to the same degree as you would expect in your kitchen! It is not advisable to sand treated timbers as this just releases a fine sawdust into the air where it can be inhaled. For those who like to D.I.Y. we have assembled construction guides for all styles of fencing gates and retaining walls. List your business for FREE! All Day Fencing, Gates, Automation, Decks, Pergolas, and all external building. Are you in the construction industry? Do you build decks, fences, gates or pergolas? List your business FREE on our trade linked website. 30,000 dedicated hits per month and growing, you are missing valuable business if you are not listed here! Tradesmen can reserve an exclusive trading area and receive all work enquiries for your area free from competition. Act now to reserve your trading area! One tradesman only per area, don’t miss out! FREE registration. Over 100 enquiries received per week in each state an rapidly growing! Suppliers: We need you. Register your business here FREE. Network with other suppliers and promote your business directly to tradesmen. Trade suppliers receive a FREE listing and will expose their business to hundreds of local trades! Fencing suppliers, building materials suppliers, wood retailers, architects, builders and anyone looking to network with other similar or related business can apply. Subscribe now FREE and start linking to other valuable industry specialists. Join for 3 months or more to receive a FREE website, FREE links, FREE email and dedicated client referrals for your area! View the various qualities of fencing styles, including; Wind protection, Fire resistance, Sound damping, Strength, Security, Aesthetics and Durability! All Day Fencing have assembled the Fence Comparison Chart to help clients choose the right style of fencing for their property. Have you considered all the options. A well designed and build fence is capable of much more than a simple divider. Fencing can improve the look of your property and even increase your home value. Fencing is an eco nomical way to dress up your home or cure problems such as sound, privacy, security and more. The Fence Comparison Chart compares 12 different but common styles of fencing used in most residential applications. Do you receive lots of road noise, is your home near a fire zone? Do you want to improve the look of your home or is your concern mainly security? With our chart you can compare the benefits and shortfalls of the fencing you require and choose the right fence first time! Contact your local All Day Fencing branch for a FREE estimate on your fencing requirements. Fencing Cost Comparison Chart, compare all fence costs! Fencing & Gates Cost Comparison Chart, compare all fencing styles for all states. Compare and Save! Choose the right fence every time! View a fencing cost comparison chart here: www.alldayfencing.com/adfprices.php, The chart shows most of the common fence styles and costs per yard. View the per yard costs for most styles before you start your next fencing project! 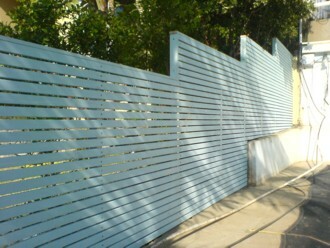 To view designs, project photos and to contact your nearest branch please visit; www.alldayfencing.com. Fencing and gates can be constructed from many different materials including timber, brick, steel, iron, brushwood, glass, stone even natural planting or prefabricated materials. For some, fences are a matter of art and there are no limitations on the materials or styles that can be used! 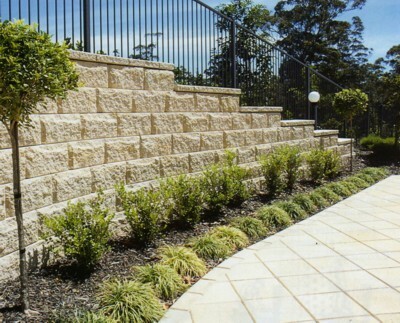 Some fencing styles such as stone, retaining walls or feature timber fencing can add considerable value to your home. Replacing your fencing with feature fences and gates can transform your property. Other cheaper styles of dividing fences add nothing or even reduce the value of your home. Before you choose our preferred fencing style view this fencing cost comparison chart and see what alternative styles you could use. Answer: This depends on the fence. If however your neighbor wants to replace the fence with a more expensive fence, you are only liable for half the cost of replacing the fence you have with a similar one. You are not required to pay for fencing if it is not in need of replacement unless you have an agreement with your neighbor. Some blocks of land may have their own positive building covenants which require the erection of quite specific fencing. This might occur in a new estate where the developer is trying to achieve a consistent look to the overall design. Most commonly, a covenant in relation to fencing will be one put on by the developer, stating that the owner can’t ask the developer to contribute to the cost. The general rule with dividing fences is that the neighbors split the cost 50/50. If both neighbors can agree on the location, style and cost, then they can simply proceed. It is, however, desirable to record the agreement in writing. Download “Letters To Serve Your Neighbors RE: FENCING” and cut and paste the letters you require to notify your neighbors of your intentions and their responsibilities in regard to your boundary fencing. My land borders public land, who pays for the fencing, 50/50? Question: My land is located next to a park. The boundary fence between my house and the park is falling apart and I want to replace it with a new wood fence. How do I get the County Office to pay for their half? Answer: According to the Dividing Fences ACT, State land is exempt from contributions towards fencing. Even if the fence was originally built by the state government any fence that borders public land is wholly the owners responsibility. Normal fencing codes apply to the height and style of fencing. If you are replacing a fence with a similar one no approval is required. If you are raising the height or changing the style of your fence you need to seek local county approval. Does the Dividing Fences Act apply to everyone? No. The Act does not bind the Crown, so where the adjoining land is owned by the Commonwealth, state or a local government and is used for public purposes (for example, roads parks or government offices) the local government or state government department is not required to contribute to the costs of erecting or maintaining a dividing fence. The Act does not interfere with agreements, contracts or covenants relating to dividing fences between owners of adjoining land. It may be worth checking your Certificate of Title or with the Department of Land Information to enquire whether there are any covenants relating to dividing fences between you and adjoining landowners. Any agreement, contract or covenant relating to dividing fences overrides the Act. View more information at: www.alldayfencing.com/adfcouncil.php. To view the different fence styles available please visit: www.alldayfencing.com. Positions Vacant Fencing Gates and Automation All States! All Day Fencing currently have several positions available for carpenters, fences, landscapers, handymen and small business managers. Established in 1993, All Day Fencing is a collection of similar minded small business owners binding together to provide a reliable, knowledge driven business system, providing opportunities far beyond the realm of the normal small business. Applicants should have a minimum 5 years experience in the fencing, landscaping, handyman, building or construction industries. Applicants must also have their own tools and transport and require a computer with access to the internet. Opportunities currently exist in most states. Please check your area is available before appliing online. To check your area please visit www.alldayfencing.com/adfagencysearch.php. For more information please visit www.alldayfencing.com/adfagencyinfo.php. 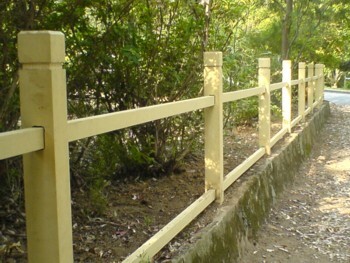 To view our website and product range please visit www.alldayfencing.com. To view job information please visit our website www.alldayfencing.com/adftenders.php. start your business for FREE..
How to build a decorative wood awning for shade or privacy! Build a decorative wooden awning for the windows around your home. Awnings can provide shade from the summer sun or privacy from overlooking properties! Made from wood available from your local lumberyard, this wood awning is easy to build and install. I built one above my BBQ to protect the cooking during light showers. I built a similar one for my rear windows which face the sun, The awning shade my window in summer but in winter, when the sun is lower, still allows plenty of light to enter. They also look great and have improved the look of my home, and possibly the value! The construction guide comes with plans, illustrations, pictures, tips for construction and suggested materials. You can cover the top with clear roofing or shingles! Easy to follow step by step gui de designed for the tradesman and handyman alike! The guide is available from www.alldayfencing.com/adfshopdiy.php. View all construction guides at www.alldayfencing.com/adfshop.php. How to build a decorative wood carport, DIY Plans for Carport! Build your own decorative wood carport easily with the All Day Fencing construction guide. This carport was built in 2004 and looks like it has been there 100 years! We used a slate looking roof tile to add authenticity. Now you can build your own from our plans! Easy to follow step by step guide designed for the handyman and tradesman alike! We have also included a guide to footings, tool guide, safety guide plus tips from the experts. www.alldayfencing.com/adfshopdiy.php. You can alter the size to suit your area. We also include a wood spantable to help you get the right sized wood everytime! How to build a decorative wood arbor, pergola. DIY plans.. Looking to improve the street appeal of your home for the least cost? Decorative fencing and gates can make a dramatic change to the appearance of your home. Modernise your home with horizontal wood slat fencing and screens or restore your home with traditional wood picket fences and gates. Are you thinking of selling your home? New fencing and gates can address issues such as noise, privacy, security, wind or fire protection and other concerns that may be preventing you from reaching the right price for your home. Incorporate a decorative wood entrance arbor (pergola) into your front fence or garden. Easy to build and they look great as a feature in your garden. You can include gates or letter boxes in the design and even a solid roof if protection from the weather is required. An entrance arbor can improve the privacy to your property. Use an electronic lock and intercom for your visitors. Keeps out unwanted guests! Arbors are bu ilt using LOSP treated wood available through your local lumberyard. The All Day Fencing ‘Guide to building Arbors’ describes in detail how to construct your own. The book contains designs and suggested materials. There is also a link to the spantables for wood so you know what size to use. The guide also contains plans, illustrations and a step by step guide to construction. 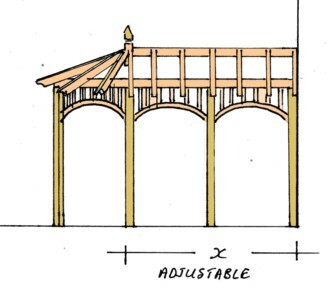 For more information on building a decorative wood arbor (pergola) and other DIY guides view the All Day Fencing plan shop at www.alldayfencing.com/adfshopdiy.php. Is Cedar or treated wood best for gates and fences? That depends on the look you want. Cedar has spectacular grain and when oiled or varnished it becomes a real feature. If you have cedar garage doors you may choose to match them with your fencing and gates. Cedar is light, durable and beautiful! Ceadr fences and gates need to be oiled regularly or stained at least every 5 years. More if the fence and gates are exposed to the sun. For look s, you can’t go past cedar but if you intend to paint your fencing and gates then treated wood is the best material. Treated wood is supplied dressed and primed ready for construction. With the increasing cost of quality durable timber, builders are rng more on pre-primed, LOSP-treated pine for exterior applications. LOSP (light organic solvent preservative) consists of preservatives dissolved in solvent and impregnated into the timber to prevent rotting, giving the timber durability in above-ground exterior applications. LOSP pre-priming is designed to temporarily protect the timber from weather and UV degradation, as well as soiling during construction. LOSP pre-primed timber, by its appearance or by the description given to it by persons handling it, is often mistaken for properly primed timber ready for top-coating. LOSP pre-primers should not be confused with premium architectural primers which are crucial to the durability of a complete coating system. Plans to build a decorative wood garden bridge, easy! Decorative wooden garden bridges make fantastic landscape features. Whether they are located over a stream or a pond, garden bridges offer a tranquil setting for your backyard. Easy to build in 2 days this is the perfect hobbie project for the weekend! Download plans including a step by step guide to construction, material lists, tips from the experts, pictures and illustrations to get you building in no time! Our our website you will find a comprehensive range of home projects that we have completed over the past few years. Visit www.alldayfencing.com/adfshopdiy.php. Construction guides available include how to build: pergolas, staircases, entrance arbor, bookshelves, windows and doors, automatic gates, horizontal slat fencing, retaining walls, huts, gazebos and more! Our plans are copyright and only availabe from our website www.alldayfencing.com/adfshopdiy.php. How to build a decorative wood garden gazebo, DIY plans! Build your own decorative wooden garden gazebos easily with our step by step guide aimed at the handyman and tradesman alike. Simple Step by Step instructions with photos and illustrations to help. We also include ‘Tips from the experts’ to have you building like a pro in no time! Gazebos make fantastic garden features and provide a cool sheltered place to sit. Gazebos can be roofed in many ways including tiles, steel sheets, shingles and even thatch! They can also be decorated by traditional wood shapes or contemporary designs. If you have a large garden consider renovation your landscape with a decorative wooden gazebo as the centerpiece! We also have plans and DIY guides for other projects around the home including: pergolas, decks, fences, gates, windows and doors, built-in cupboards, roof repairs, entrance arbors, attic ladders, auto gates and much more! how high does my swimming pool fence & gates have to be? All swimming pools no matter what age MUST have a child-proof and secure pool fence. Local counties control the guidelines and consent for swimming pool fencing. Various materials and designs must comply with county requirements on safety. Generally, pool fencing and gates must be at least 1.2m high from the outside ground level, and can contain no foot holds. Gates must be fitted including approved child safety catches. Picket fences should have no rails closer than 1.2m and must be spaced at less than 4″ (100mm). Pool gates must be fitted with a self closing child proof latch. For more information refer to the following guide: www.alldayfencing.com/adfcouncil.php. Free business listing for tradesmen, construction jobs, need work? Are you in the trades, home services industry? List your business FREE online and receive exclusive work leads for your preferred area (conditions apply). All Day Group home services, fencing and gates, trades and construction jobs. FREE BUSINESS LISTING… www.alldayfencing.com/adfagencysearch.php LIST YOUR BUSINESS FREE! All Day Fencing, part of the All Day Group will place a small advertisment plus a link to your webpage on the All Day Group trades site. You business will be cross promoted FREE to your local area and to local business and trades via our unique marketing system. Your listing will be promoted through Twitter, WordPress, Facebook, Trade Directory, Business Lister, Hot Frog, Start Local, Free enterprise, My Space, Google and many other cross linked browsers. Subscribe to our service (from only $4.80 per week) and receive an exclusive trading area without competition plus a FREE webpage linked to our site, plus FREE email and unlimited messages! Start and build your business here! Act now to reserve your local area. Check your area is available … www.alldayfencing.com/adfagencysearch.php. View our website for more details… www.alldayfencing.com/agencyinfo.php. In the trades? need work? look no further! Agents required! All Day fencing, Gates & Automation seek skilled tradesmen to install our range of fencing, gates and automation. All Day Fencing seek multi talented tradesmen who can organise a team/s of workers to complete small jobs. If you are currently self employed, own your own tools and transport this is for you! Applicants require good communication skills suitable for onsite quotations and appointments. Applicants will also require a home computer connected to the internet, to link to our office and receive work enquiries. Check availability and register for an exclusive trading territory here: http://www.alldayfencing.com/adftenders.php. For more information go to: www.alldayfencing.com/adftenders.php. A dividing fence is a fence that separates the land of different owners whether the fence is on the common boundary of adjoining lands or on a line other than the common boundary. A dividing fence does not include a retaining wall. 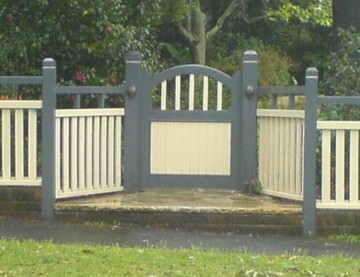 a fence determined by a Magistrate in a Magistrates Court to be a sufficient fence. Note: A fence which accords with (c) or (d) is only a sufficient fence where no local law or agreement is made. Information on the Dividing Fences: www.alldayfencing.com/adfcouncil.php#council. Information fence & gate laws: www.alldayfencing.com/adfcouncil.php. How to build your own decorative wood privacy screens! Privacy screens can be constructed from most materials with timber lattice or slat the most popular. They can be incorporated in deck design, as part of the fence structure or concreted straight into the ground. Decorative privacy screens can add usable space by enhancing visual appearance. Privacy screens are great for hiding garbage bin bays or anything that is unsightly, ugly or hazardous. Privacy screens can be constructed to many shapes and sizes. The most common being the lattice or horizontal slat screens. Fencing and gates can be constructed to match your privacy screens. Horizontal screens: If using horizontal wood or aluminium slats you will need square steel or wood posts spaced at 2′ (600mm) apart. Steel posts will stay straight for many years keeping the structure straight and true. Vertical: If you are using lattice or vertical picket designs use 4″ x 4″ (100mm x 100mm) wood posts spaced at no more than 7′ (2.1m). Rebate timber rails into the back of the posts and fix the pickets to the front of the rails. Rails should be spaced no more than 3′ (900mm) apart and 10″ (200mm) from the end of the pickets. If your fence or screen is higher than 4’6″ (1.3m) you will need to allow for 3 horizontal rails. Dig a footing 12″ x12″ x24″ deep, for each post. Start by concreting the two end posts first then setup a string line along the top of your posts. Concrete the other posts using a level and the string line. Cut a rebate for your wood rails (usually 3″ x 2″). Cut the rails, joining only at each post and fix into position. Fix the pickets, lattice or panneling into position. Make sure to paint all joins prior to assembly. For more information on horizontal slat screens and fences including suggested wood, designs, installation advice and DIY plans visit www.alldayfencing.com/adfslat.php. 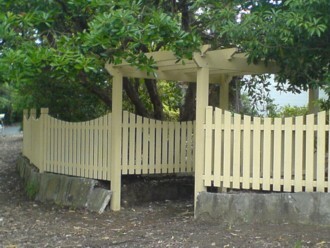 For more information on decorative wood privacy screens including suggested wood, designs, installation advice and DIY plans visit www.alldayfencing.com. Pergolas can enhance the look of your property while providing shade or shelter. A well designed pergola will increase the value of your home while at the same time making your outdoor spaces more usable. View all designs at our website www.alldayfencing.com. 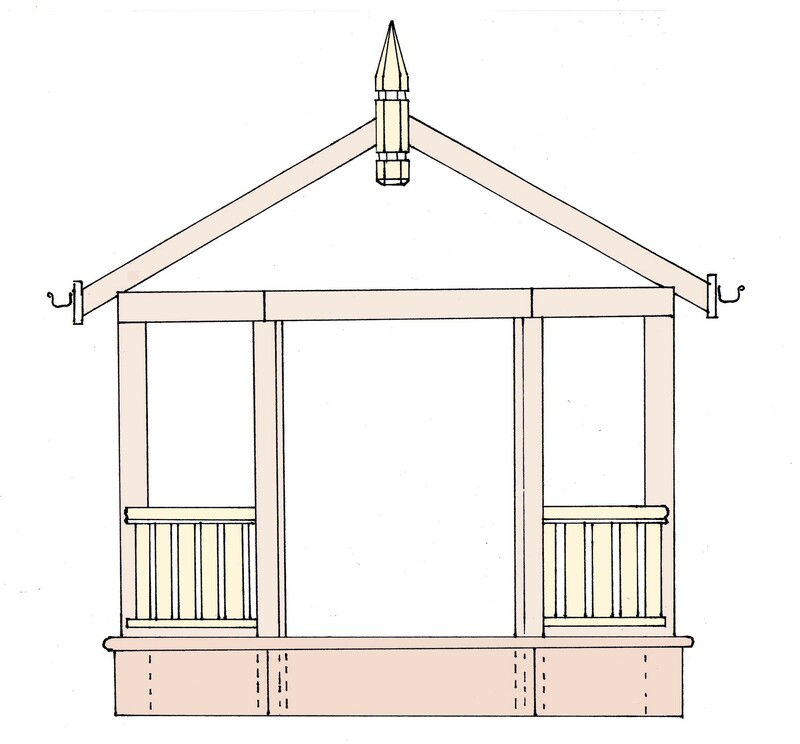 Pergolas can be left open or be finished with a row of wood battens for shade. You can also fix roofing such as laserlite or colorbond to your pergola. 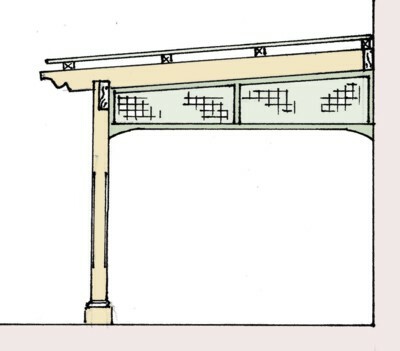 Pergolas come in several designs. The ‘lean to’ pergola is built off the side of your home. 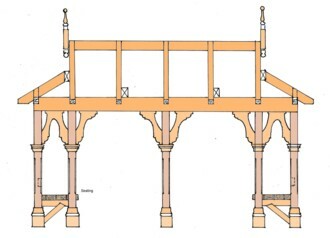 Generally a lean to pergola is attached to the house structure. 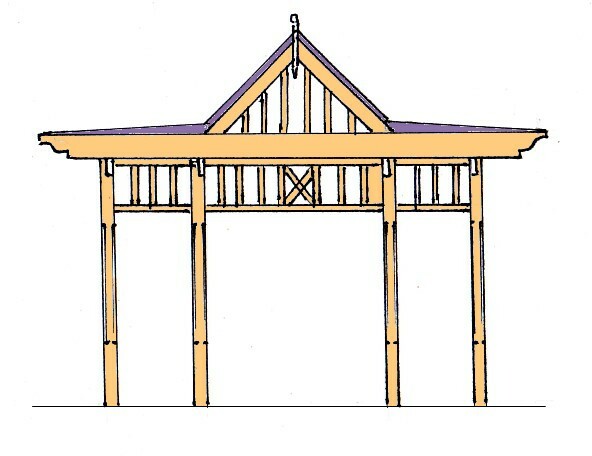 A freestanding pergola is built to stand on its own and requires bracing. 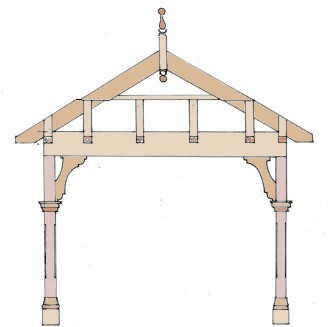 A radial pergola is one that is built in a curve shape with the rafters fanning out from one fixing point. 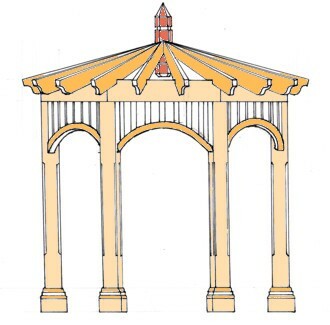 A completely circular pergola is called a gazebo and often contains seating. 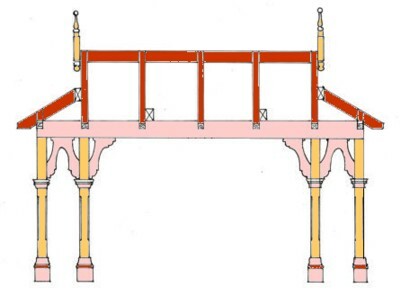 Wood pergolas are easy to make and are erected quite quickly. 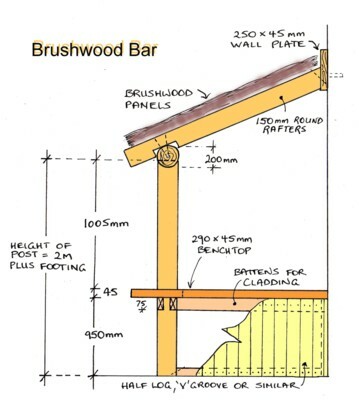 To design your pergola you need to know what size wood is required to span the area you want. The larger the span, the larger wood is required. Visit our website to view the wood spantables: www.alldayfencing.com/adfshopdiy.php. All Day Fencing have built and installed many pergolas and have assemled some of the best DIY plans for you to do yourself. 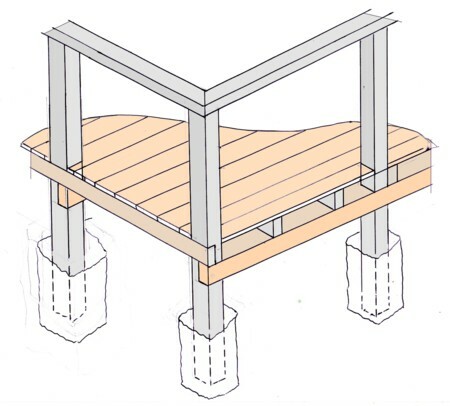 All plans come with a step by step guide to building a wood pergola plus footing design, pics, illustration, tips from the experts, materials lists and spantables to get you building in no time! How to install an automatic sliding driveway gate, DIY Plans here.. Install your own automatic sliding gate easily in just one weekend! If you are constructing your own gate please download the Gate Construction Guide and DIY Plans at: www.alldayfencing.com/adfshopdiy.php. Sliding gates require a base for the track to sit on. The base can be constructed out of concrete. Excavate a footing for the concrete 200mm deep and 150mm wide. Lay some reinforcement steel in the trench and concrete to the level required. As concrete shrinks when it sets it is advisable to let the concrete set then bed you track down using a wet mix of sand and cement. Fix the track with concrete approval bolts. The track must run for the full length of the gate plus the opening length. Sliding gates that are going to be automated should be 16″ (400mm) longer than the opening. This is to allow room for the motor. When construction your gate frame you will need to recess two rollers at the bottom of the frame about 18″ (450mm) in from each end. Inch and a half (40mm) square steel section is advised for the frame with a 6″ x 1.5″ (140mm x 40mm) bottom rail to allow for the rollers and gear rack. If you intend to fix vertical wood pickets or panels than your frame will need a midrail. If you are fixing horizontal wood slats or boards, you will need vertical members in the frame at around 2′ (600mm) centers. To hold the top of the gate you will require a double roller and bracket setup as shown. Fix the roller bracket to the side fence post above the motor. View 100’s of gate designs here… www.alldayfencing.com/adfgates.php. Several gate motor kits are available. Fix the motor to a concrete pad and position it so the gear wheel faces the gate. Screw the gear rack to the bottom rail of the gate so the gears interlock. Most auto gate systems come with self programming features which enable the motor to learn the start and stop points. There is no need for a stop or lock a the electric gate motor will hold the gate firmly in position. 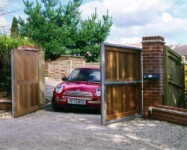 Most systems are suitable for heavy and light gates up to 350kg and 4.5m wide without a lock or up to 6m with the use of a lock, the gates will slow down at the end of opening/closing operation avoiding loud noises and maximising durability, and, once the gate is closed it can’t be pushed open by intruders! 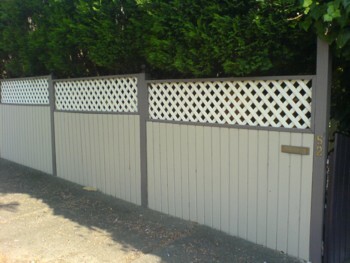 For more information and/or to view pictures and past projects please visit our website at www.alldayfencing.com.